Becca Comeau almost died last year; the sixteen year old was hit by a car while walking along a road with a friend in Massachusetts. With many broken bones and internal injuries, her doctors thought she would not pull through. Today an observer would not believe that this young woman was on the threshold of death; she is as vital and enthusiastic as any teenager is. But, there is a serious side to Becca; her life has been difficult both before and since the accident because Becca and her mother have been homeless and living on the edge for several years. Becca has turned to poetry as a means to both sort out a life, which people several times her age cannot even imagine, and to express her courage and commitment to living even when everything seems chaotic and uncertain. 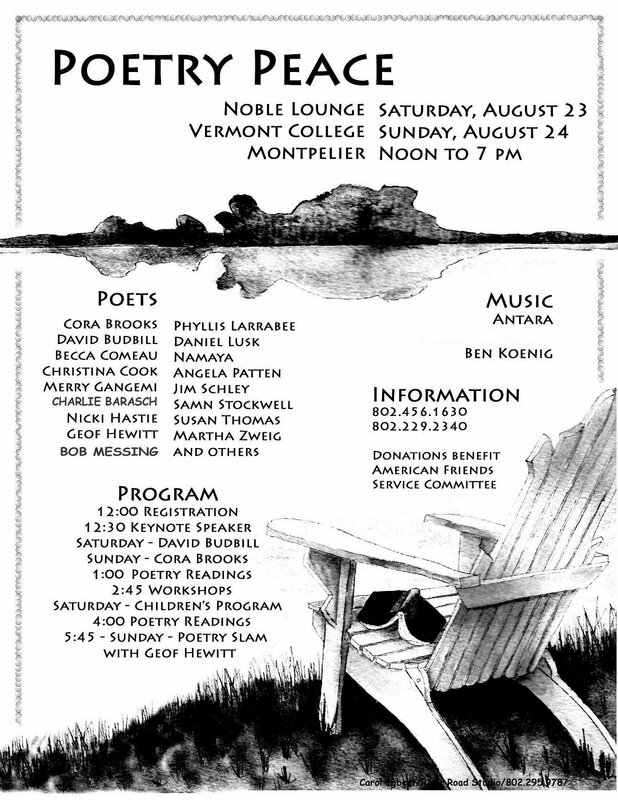 On Saturday and Sunday, August 23rd and 24th, Becca and many other Vermont poets will be speaking their poetry at Vermont College of Fine Arts in Montpelier. The event, Poetry Peace, will include readings, writing workshops with Susan Thomas, Christina Cook, and Cora Brooks. The event also features a children’s program with Namaya on Saturday at 2:45; and poetry slam with Geof Hewitt on Sunday at 5:45, music with Ben Koenig and Antara, and keynote speakers David Budbill of Wolcott, and Cora Brooks of Montpelier. Organized by Woodbury poet Merry Gangemi, donations will benefit the American Friends Service Committee in Vermont, a Quaker organization working for justice and peace. In addition to Budbill and Brooks, Comeau and Gangemi, poets include Susan Thomas (Marshfield), Geof Hewitt, Bob Messing, and Samn Stockwell (Montpelier), Martha Zweig (Hardwick), Jim Schley (South Strafford), Namaya (Brattleboro), Daniel Lusk and Angela Patten (Jonesville), Phyllis Larrabee (Woodbury), Christina Cook (Hanover, NH), Ann Day (Waitsfield), Charlie Barasch (Plainfield), Nicki Hastie (Nottingham, UK), and others. Ben Koenig (Plainfield) and Antara (South Burlington) will perform Saturday and Sunday, respectively, at 2:45 in the Noble Lounge. On both Saturday and Sunday registration begins at noon at Noble Hall on the Vermont College campus in Montpelier. Keynotes begin at 12:30. Readings, music, and workshops scheduled from 1:00 until 7:00 pm. People are welcome to arrive at any time on both days. Bring the kids, bring your friends. A full program schedule is available at AFSC VT. For more information contact the AFSC at 802-229-2340 or jgainza@afsc.org.